Solid hardwood vs engineered vs wood-like flooring. Maple vs oak vs cherry. Some people are surprised to learn just how many options are available when it comes to wood flooring in Indianapolis. So... what's your hardwood type? You know you want a wood floor but which wood floor is best for your needs? A lot depends on where you're putting the flooring. 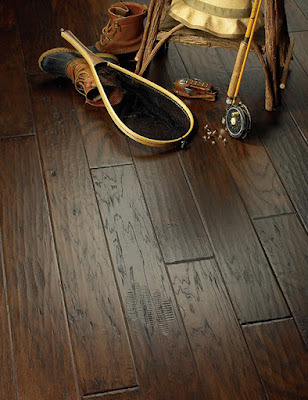 Solid hardwood is the "go-to" when it comes to wood floors. Properly cared for, it lasts for decades. However, solid hardwood is a little fickle when it comes to installation. Engineered wood is a good alternative with its cross-ply construction beneath a top, durable layer. That difference makes it work in many more situations than solid hardwood. Today you have a third choice when it comes to wood floors. It's actually not wood material but the appearance is so similar that many people will never know. Porcelain tile or luxury vinyl offer a beautiful wood-like flooring that is durable and water resistant. If you have a space that isn't quite right for solid hardwood or engineered wood, take a look at these wood-like options for the appearance you want in a more versatile floor. Cherry: Varies in color from reddish brown to a creamy blush. Easy to stain and has a fine grain with a smooth texture. Walnut: Rich, dark brown with grey undertones. Walnut's dark, swirling grain patterns add a design dimension to your floor. Oak: Almost neutral in color, it is a light wheat in its natural state. Very easy to stain with an open grain pattern. Maple: Perhaps the lightest in color of all hardwoods, it is almost white in its natural state. With its very light grain pattern, maple takes very well to all stains. Hickory: Varies from light blonde to darker brown. Hickory has a distinctive grain pattern often with visible knots for a distinct look. Our free design experts can help you narrow down on your hardwood type. Stop by our showroom and we'll get started by talking about your preferences, home and budget. Then we can guide you to the best wood floor for your needs.